Comedian Shayne Smith finds humor on the other side of a life of crime. Shayne Smith isn't exactly the kind of guy you'd figure to be a stand-up comedian. Then again, it would be hard to get a handle on him no matter what his profession. With tattoos covering both sides of his face and his neck on down, he admits he often makes a shocking first impression. There's also the fact that he's a former gang member. 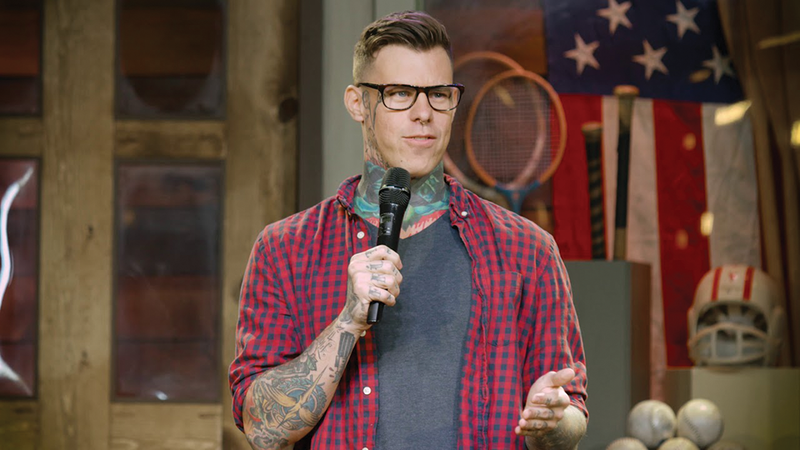 To his credit, this 32-year-old Salt Lake City homeboy has incorporated these odd elements into a comedy career that has reaped him stellar success. A co-host of the aptly-named Freaky Geeks' Podcast and winner of the 2015 Salt City Superstar Comedy contest, Smith was voted Best Alternative Comedian of 2016 by City Weekly. The tattoos notwithstanding ("I like the way they look," he says, when asked about the unorthodox embellishments), Smith looks much more like a comedian than a criminal. With his neatly trimmed hair, glasses and affable attitude, it's hard to imagine him running with any group more intimidating than the local chess club. "I don't look violent, so I see how people don't think I am the type," Smith says. "I grew up a horrible white-trash street kid who stole to get by and wasn't afraid to hurt someone if I thought they deserved it. That carried into my adult life. Stealing to eat turns into stealing a car to pay rent, and you sell that car's parts and meet a shady guy who introduces you to someone who is looking for people to rob a store. You do a good job robbing that store, and meet someone who wants to rob a drug dealer, or hurt someone for money. You do it well and before you know it, your lifestyle is crime." Hearing him explain his trajectory—which he inevitably and unabashedly shares in live performances—almost makes it sound like he was plotting a career path in crime like a brokerage clerk plans a rise in the ranks of an investment company. "I am a nerd, and being a criminal is a job," he insists. "There are people of all types that do jobs. It's as simple as that." Fortunately, Smith eventually came to realize that being in a gang wasn't the best career choice. "Seeing my brother doing things I was also doing gave me perspective and kind of helped me to see how far we had come from needing to steal because we couldn't afford food or winter clothes," he says. "It stopped being about survival and started at some point becoming about getting 'more' at any cost. Both of us agreed mutually to turn it around, and so we just did." Still, don't mistake Smith for one of those reformed types who suddenly sees his mission as warning others about the dangers of the dark side.He's not the preachy type, and he's far more sarcastic than sanctimonious when describing his past misdeeds. Purveying the positive is not his intent. "I just happen to think there's something funny about everything, no exceptions," he maintains. "People see how much fun I'm having, and they come away feeling positive. So many people tell me I'm a very positive person, and it always cracks me up, because my stand-up on paper is very dark. I speak openly about being mentally ill online. I am thankful people like how much fun I am having with life, despite how horrific it is." Drawing his material mainly from real-life experience, Smith says he's a storyteller of sorts. "I will remember a story or something I want to talk about and go on stage and just start goofing off with the premise," he says. "If audiences seem receptive to the concept, I will actually take the time to write it out and punch it up. Otherwise, material comes from just hanging out with other comics and trying to make them laugh. "No. 1, 100 percent, I just want to make people laugh," he continues. "Anything else that happens is a bonus, and I am always very flattered when people say I inspired or helped them. But laughter is the goal. It's wild to think people are inspired by me when I just speak recklessly into a mic for a living. Yet if I'm somehow helping people get through their struggles with cancer or depression, it's awesome, and I am blown away." To that end, Smith's goals are simple: Growing his audience; maybe becoming a comedy writer for a TV show; appearing on Conan. "Honestly, that's kind of the end of the bucket list," he says. "I just wanna laugh and make people laugh."